A holiday to the rhythm of the samba in a magnificent Brazilian villa! 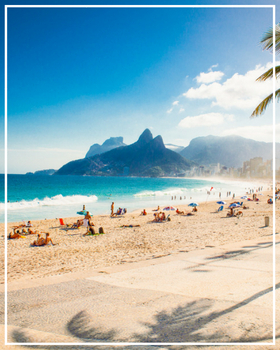 Bossa nova, carnival, ocean as far as you can see, tropical climate... go and discover Brazil! This interracial land is a dream destination, certainly for its sun-drenched beaches, its swinging music and its joyous carnival, but also for its richness of people and culture. To experience the best of your holiday, put your suitcases in one of our villa rentals in Brazil; we have a selection of the most beautiful houses and apartments in Rio de Janeiro. Ideally situated just a step or two away from the mythical beaches of Copacabana and Ipanema, or in the chic quarter of Leblon, our luxury Brazilian villas offer a combination of design and comfort. Additional services (care taking, babysitting, cooking) are available.